Our range of products include wireless water level controller, automatic water level control, water level controller with starter 20amp, three phase liquid level controller and liquid level automation. Wireless Water Level Controller for two Tanks. • This has Voltage Sensing technology so the motor is protected up to Starter terminals. • Phase failure / loss from the supply side. • Phase reversal / wrong phase sequence from the supply side. • Phase to phase voltage unbalance. • Electronic overload ( site selectable). • Remote sensing dry run / No load current ( site selectable). • Extreme high current (EHC) or short circuit more than 24 amps. • Pump Current Setting is easy, accurate, auto setting type, with digital display. • Pump current setting can be done through SMS, Mobile phone onsite. • Overload is site selectable from 20 to 50 % of set current. • Dry run setting from 75 to 95 %. • Dry run bypass facility by SMS / PHONE. • Site selectable Auto / Manual operation switch. • Calibrated Digital Voltmeter with ± 2V Accuracy. ( Data by SMS ). • Display Shows the all settable range and trips current value of set parameter online. • Digital display for fault value at tripping. ( Data by SMS only). • On-site Auto Fault Detect (AFT) for AC voltage, LEDS, Display, Relay, etc. 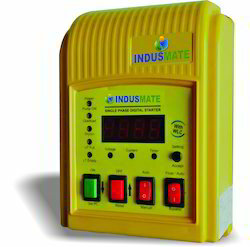 • Site settable auto start timer for power failure (3-300 secs) and SPP faults from the supply side. • Site settable star delta timer (3-30 secs.). • Time delay to filter power on spikes and surges. • Suitable for DOL, Star-Delta Starters. • 4 Digit Password protected operation. • Talks verbal information in required language. • Works on wide voltage supply (225 to 500 V). 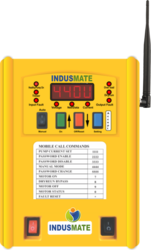 • Facility to check network communication between GSM SIM and dialer phone. • No call charges when power is absent. • Auto call disconnect facility to save call charges. • Motor ON and OFF switch on unit. • Switch for Easy bypass and network checking. Counted as first among the best, we provide the best quality of Automatic Water Level Control. Manufactured by using modern machinery and technology, these products are used for detecting different levels of water in a tank. Compact design, sturdy construction and easy operation make these products highly demanded in the market. 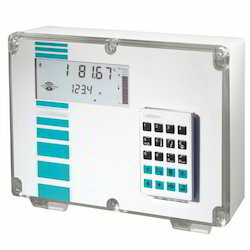 Fully Automatic Water Level Controller for upper and lower tank. Indications for low, middle, and high levels of water in a tank. Site selectable auto / manual operations. Model is universal ie can be connected with float switch / metal sensors / magnetic switch. Compact, vermin proof, rust proof engineering plastic box. Options -Available for 230 and 415 voltages. Highly reliable multilayer molded float switch suitable for any fluid up to PH 4. Site adjustment for height as per tank size. The wire of float is rated at 10 amps current load. Banking on our immense domain expertise, we are engrossed in providing premium quality Wireless Water Level. The offered product is made using high grade raw material under the supervision of our knowledgeable experts. Ideally suited for users across the industry, the offered product can be purchased from us at market leading price. Two Tank Fully Automatic Water level controller with indications for upper tank full and lower tank empty suitable for Float switch / sensors. Voltmeter and Ammeter to know site voltage and current at site. Running capacitors (2) as per pump requirements. Widest working voltage range from 140 to 300 volts. Specially made heavy duty air sealed 40 amps dc coil contactor for long life to withstand high inrush current spikes up to 100amps. We are an eminent name in this domain, engaged in providing Three Phase Liquid Level Controller. With an aim to attain maximum client satisfaction, the offered product is precisely designed by our experts in accordance with the set industry standards. We make sure that we deliver only the best quality product to our clients. Indications for low, middle, and high levels of water in the tank. By capitalizing the skills of our professionals, we are manufacturing, trading and supplying a customized array of Liquid Level Automation. The brand name of our product is Khyatee. Also, it is manufactured as per the set industrial quality norms and tested in compliance with the quality parameters. Our product consistently monitors the liquid level of the overhead reservoir and tank due to which it is extensively used in various places. Also, smooth functioning of our product satisfies the customers most.